This chapter analyses the experience of civil resistance of the Yaqui and Guarijio tribes in Sonora, Mexico. The first ones moved from violent resistance to nonviolent resistance, while the second ones moved from passive resistance to active civil resistance. These indigenous groups have exercised civil resistance against the state and private sector companies in order to defend their water resources, which, in their worldview, are an essential part of their lives, territory, and culture, and are essential for their survival. In particular, it argues that the emergence of a civil resistance process is not sufficient, nor is the capacity of resistance of the indigenous groups involved in this process. It is also necessary to overcome a set of conditions in order for these groups to effectively achieve their goals. 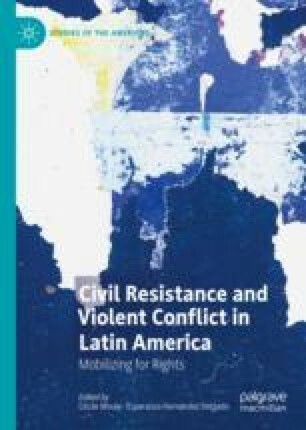 This chapter is the product of the research: “Contributions to peacebuilding from Latin America: Experiences of nonviolent resistance in contexts of violent conflict in Brazil, Colombia and Mexico”, carried out between 2015 and 2017, with the support of the Office of the Vice-Rector of Research and Transfer (Vicerrectoria de Investigación y Transferencia [VRITT]) of the University of La Salle. It was developed in partnership with Facultad Latinoamericana de Ciencias Sociales (FLACSO) Ecuador. It is also part of the research group “Educación y Sociedad”. López, Mario. 2016. La resistencia civil examinada: de Thoreau a Chenoweth. Polis 43. https://doi.org/10.4000/polis.11508. Mouly, Cécile and María Belén Garrido. 2018. No a la guerra: resistencia civil en dos comunidades periféricas de Colombia. Desafíos 30 (1): 245–277. https://doi.org/10.12804/revistas.urosario.edu.co/desafios/a.5282.